***In 2018 there were a total of 168 hours 30 minutes wasted due to missed appointments. This equates to 17 working days! We are currently experiencing a high demand for Nurse appointments. Please be aware that we may not be able to offer routine appointments with the Nurse team at short notice. Patients are advised to book in plenty of time for appointments that require medications to be renewed, blood tests needed for hospital appointments and repeat injections etc. It's that time of year again! 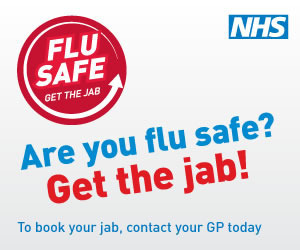 Book your flu jab with us now!